Handel, George Frederic was a German-born composer, who worked primarily in England, considered one of the most im­portant masters of the baroque period (from about 1600 to 1750). Handel and his German contemporary Johann Sebastian Bach* are considered the greatest composers of the early 18th century. * Bach, Johann Sebastian (1685-1750) — German composer. Their music represents the culmination of musical gen­res of the baroque era. Whereas Bach’s output consisted chiefly of instrumental and vocal works originally conceived for Lutheran church services, Handel’s most important works are operas and oratorios, composed for the theatre. The most famous of these is Messiah, which was first per­formed in 1742. Handel also made impor­tant contributions to instrumental music. George Friedrich Handel was born in Halle, Germany (he later anglicized the spelling of his name). He began to study music, probably in 1692, with Friderich Wilhelm Zachow, a church organist in Halle. At age 17 Handel became organist at Halle’s main church, the Dornkirche. He resisted a career as a church musician, however, and in 1703 moved to Hamburg, an impor­tant centre for opera in Germany. At first he played violin in Hamburg’s opera or­chestra, but by 1704 he had composed Almi­ra, his first opera, turning to the genre that would consume much of his creative life. In 1706 Handel departed for Italy, the birthplace of opera, and spent the next four years in Rome, Florence, Naples, and Ven­ice. During this time he composed a large number of cantatas (compositions for voice and accompaniment designed for an inti­mate setting) and Italian oratorios (large-scale, unstaged dramatic compositions for vocal soloists and instruments), including La Resurrezione (The Resurrection, pro­duced 1708). He also composed his first indisputably great Italian opera, Agrippi­na (first performed in 1709). In 1710 Han­del returned to Germany and became court composer for the elector of Hannover, who would become King George I of Great Brit­ain and Ireland. During the 1720s and 1730s Handel worked primarily as a composer of operas for the London stage. This extremely pro­ductive phase of his career began with the opening of the Royal Academy of Music in London in 1719. The Royal Academy was founded with the support of the king and aristocratic subscribers for the pro­duction of Italian operas. Its directors sent Handel to continental Europe to hire some of the world’s greatest singers. Handel was not the only composer writing operas for Academy productions, however. The Acad­emy opened in 1720 with a production of Italian composer Giovanni Porta’s* Numitore, and during the first years of the Academy the operas of Giovanni Bononcini**, another Italian, received more per­formances than Handel’s operas. *Porta, Giovanni (c. 1690-1755) — Italian composer. **Bononcini, Giovanni Maria (1642-1678) — Italian composer. The Academy produced some of Handel’s great­est operas: Radamisto (1720), Giulio Cesare (1724), Tamerlano (1724), and Rodelinda (1725). But in 1728, financial diffi­culties and quarrels among its directors led to the Academy’s collapse. The year before, Handel had become a na­turalized citizen of Britain. Handel and Swiss opera manager J.J. Heidegger founded a new Academy in 1729. It faced competition from the Op­era of the Nobility, a rival opera company founded in 1733 with the support of the Prince of Wales. Although the prince’s company lured away many of Handel’s singers, Handel continued to compose and produce operas until both companies went under in 1737. These years also saw the production of some of Handel’s best oper­as, including those based on chapters from Italian writer Ludovico Ariosto’s* epic poem Orlando furioso (1516): Orlando (1733), Ariodante (1735). *Ariosto, Ludovico (1474-1538) — Italian poet. Handel suffered a stroke in 1737 and later year joined a new opera company, probably managed by Heidegger. Although Handel continued to write operas until 1741, he had by than also written a number of oratorios. The oratorio provided a new direction for his last decades of creativity. Handel began to concentrate on oratorios in English in 1732, following a successful revival of Esther in London that year, and by the 1740s he composed an average of two a year. His oratorios differ from his operas in a number of respects. Unlike op­era, oratorios are performed in concert, without costumes, scenery, or staging, and are consequently less expensive to produce. Whereas his Italian operas generally draw upon ancient history, mythology, or epic poems for their plots, the English texts for the oratorios are most often based upon the Hebrew Scriptures. Like opera, orato­rio includes recitative (singing of text over sparse instrumental accompaniment, with­out a specified meter) and aria (an air or song with musical accompaniment, sung by one person), but the arias in Handel’s ora­torios are generally simpler and less florid than those in his operas. There are two probable reasons for this simplicity. First, Handel used many native English singers in his oratorios, who though skilled lacked the virtuosity of international opera stars. Second, oratorio does not rely on the orna­mented “exit aria” that an opera singer performed before leaving the stage. Orato­rio provided Handel with the opportunity to compose many grand choruses, on which his reputation today rests. Handel also wrote works similar to oratorios but with­out dramatic plots; these works were based on poems by English poets John Dryden (Alexander's Feast, 1736) and John Milton* (L’Allegro, II Penseroso ed II Modera­te, 1740). * Dryden, John (1631-1674) — English poet and dramatist. Milton, John (1608-1674)— English poet and prose writer. The most famous of Handel’s oratorios is without doubt Messiah (1742), which has remained part of the repertoire from Han­del’s time until our own. He also composed a number of equally great oratorios that are less well-known, including Saul (1739), Israel in Egypt (1739), Belshazzar (1745), and Jephtha (1752). Some of his best in­strumental works were written to be played with the oratorios, including the organ concertos (works for solo organ ac­companied by orchestra) of Opus 4 (1738) and the 12 concerti grossi (works for or­chestra alone) of Opus 6 (1740). Handel also created the well-known Music for the Royal Fireworks in 1749 to celebrate the end of the War of Austrian Succession (1740-1748). While composing the chorus “How dark, ОLord, are thy decrees” for the oratorio Jephtha in 1751, Handel began to lose his eye­sight, although he completed Jephtha in 1752. During the last years of his life, Han­del supervised revisions of his oratorios. Handel died in his home in 1759 and was buried in Westminster Abbey in London. Handel’s most important contribution to history undoubtedly lies in his oratorios. Although the genre had existed in the 17th century, Handel seems to have invented the special type known as English oratorio, with its dazzling choruses. His influence on lat­er generations can be seen most clearly in the history of the oratorio: Handel’s Mes­siah is one of only a few 18th-century works to remain in the performance repertory from its composer’s lifetime until today. The or­atorios of later composers Josef Haydn of Austria and Felix Mendelssohn* of Germa­ny are unthinkable without Handel. *Haydn, (Franz) Joseph (1732-1803) — Austrian composer. Mendelssohn (-Bartoldi), (Jacob Ludwig) Felix (1801 -1847) — German composer. Handel was also an innovator in the realm of instrumental music. His organ concertos, along with Bach’s harpsichord concer­tos, are among the earliest concertos to fea­ture a keyboard as the solo instrument. Al­though Handel’s operas disappeared from the stage with the entire body of early 18th- century opera seria (serious opera), success­ful revivals during the 20th century have led to a rediscovery of the musical and dra­matic effectiveness of Handel’s compositions for the theatre. 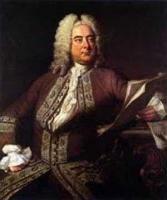 Today Handel is recognized by many as the greatest composer of late-baroque opera seria.